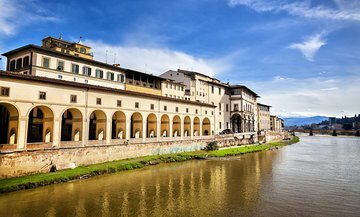 Widely considered among the world’s finest art spaces, the Uffizi Gallery is one of Florence’s top attractions—with often long queues. With this tour, dodge the wait with skip-the-line entry and hear the secrets of Renaissance masterpieces by Botticelli, Da Vinci, and Giotto from your private guide. With your Firenzecard included, enjoy admission to 72 museums across Florence—including the Basilica of Santa Croce and the Gallery of Modern Art.